Need a good idea for a nursery rhyme costume? LoveToKnowBaby is here to help! We've compiled some of the best nursery rhyme costume ideas for your little sweetie. Whether you're looking for a great Halloween costume, or you're searching for a costume for your toddler to wear in a nursery rhyme parade or costume contest at preschool or your local library, we're got some great ideas! We'd love to hear from you! Add your favorite costume ideas to this article, and inspire others to do the same! Your thoughts and ideas are important to us! Does your little girl long to look like Little Bo Peep or Little Miss Muffet? 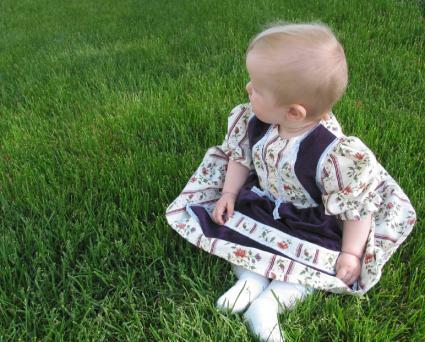 You can adapt almost any dress pattern to look like one of these favorite nursery rhyme characters. Either purchase or make an adorable dress. You'll probably want to add a pinafore and maybe fashion a bonnet to match. If the dress doesn't come with a pinafore or bonnet, you can easily make one in matching fabric. Here are some easy pinafore directions. For some easy bonnet patterns, check out this site. For added fun, add some ruffled long bloomers to the look! The costume is really all about accessories. If you want your child's nursery character to be easily recognizable, then you need to add a few well-known additions. She'll need a spider of course! You can probably find these in a dollar store or department store. A furry stuffed spider will look cuter than a plastic one. Just attach the spider to Miss Muffet's dress as if it is crawling up the skirt. Simply purchase a small sheep or lamb for your little one to hold, and nobody will have trouble wondering who she is! Want your little guy to look like he just stepped out of a nursery rhyme book? There are lots of fun characters to choose from, such as Little Boy Blue, Jack Be Nimble, Peter Peter Pumpkin Eater, and Old King Cole. Check out the following ideas for creating these great costumes. This costume is easy to create. All you need is some blue overalls and solid blue or blue and white checked shirt. Purchase overalls that are a little larger than your child typically wears and roll them up at the bottom. Add a straw hat, and a small plastic trumpet, and you're in business! You can use almost any type of clothing for this nursery rhyme costume, but cute pajamas look great! Create a small patch for the seat of the pants, so that it looks like the bottom of Jack's pants were burned from jumping over the candlestick. Then find a cute candlestick and candle that will stay together easily, so your little character can hold it without too much difficulty. For this outfit, you have a wide variety of choices in clothing. The main prop for this outfit is a pumpkin. Look for a small pumpkin that your son can carry. Cut out a couple of sections of the pumpkin so that it looks like the pumpkin has been eaten a little. You can embroider or stitch the name "Peter" to the front of your child's costume if you like. If your child has a bathrobe, you're already on your way to creating a great costume for your little king! If you're really creative, find some sparkly trim to add to the edges of the robe. Purchase a gold crown at your local dollar store. How easy is that? Baa, Baa Black Sheep-Add a small bag of cotton balls for an added effect! Mouse from Hickory Dickory Dock-Be sure you add a small clock to this costume! You can purchase these costumes, or make them without too much trouble. Create a simple generic costume out of a sweat suit with a color that matches the character. For example, choose a red costume for the ladybug and hot-glue cut-out felt circles in black. Choose a gray sweat suit for the mouse, and a black sweat suit for the sheep. For cat or mouse ears, purchase a headband, cover it in matching material or felt, and fashion some felt ears to match. These can be easily sewn or hot-glued to the headband. Add tails out of small cording, felt, or cotton balls.